Based on Intel's Thunderbolt™ 3* technology, the new Thunderbolt™ 3 cable with the new USB Type-C connector enables 40 Gbps bi-directional data transmission and reversible connectivity. The cable supports up to 100 W power delivery and multiple data protocols such as USB 2.0 (4.8 Mbps), USB 3.1 Gen 1 (5 Gbps), Gen 2 (10 Gbps), DisplayPort 1.2, and PCI Express. The new Thunderbolt™ 3 cables enable high-speed user experiences like never before: single-cable docking, multiple 4K video displays, external graphics for high speed gaming, and Thunderbolt™ networking between Computers. All Thunderbolt™ products undergo certification to ensure optimal operation and end-user experience. The certified products provide higher and more reliable data transmission at a high-speed of up to 40 Gbps. In addition to the Thunderbolt™ certification, Sumitomo's Thunderbolt 3 cables have also been USB Type-C certified by the USB Implementers Forum. "Thunderbolt™ 3 brings Thunderbolt to USB Type-C at speeds up to 40 Gbps, creating one compact port that does it all," said Jason Ziller, Director of Thunderbolt™ Marketing, Intel Corporation. Concerning the cooperation with Sumitomo Electric, "We are pleased to have worked with Sumitomo over the years to ensure their cables help to provide users with a great Thunderbolt experience." * Thunderbolt™ 3 technology realizes high data transmission of 40 Gbps between a PC and peripheral devices. It delivers great responsiveness in data transmission in daisy chain connection. 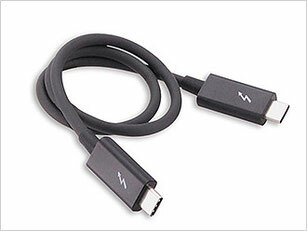 Intel and Thunderbolt™ are trademarks of Intel Corporation in the United States and other countries.